This 6-hour program provides participants with a basic level of understanding if the hazards of confined spaces and the requirements for safe entry. The program will give participants the ability to apply the general information to their specific work-site and specific conditions that they have to experience. Definitions: How to identify a confines space. 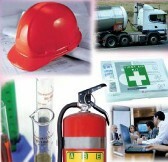 Hazards: Oxygen deficiency, Flammable gases, Explosive atmospheres, Toxic vapors. Pre-entry procedures: Pre-entry planning, Developing codes of practice, safe work permits.